We are Georgia’s official state museum of art, and we offer free admission to all. 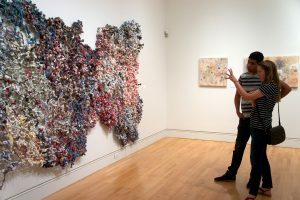 As we organize exhibitions drawn from around the world, we help visitors of all ages make meaningful, personal connections with art, provide students with real-world experiential learning and better our community and state on a daily basis. Help the Georgia Museum of Art better communities through art by supporting the fund below. Contribute to the museum’s annual fund and your support will be immediately applied to the areas of greatest need within the museum’s operations. Want to contribute to a different fund at the Georgia Museum of Art? Go to our donation page or visit the Georgia Museum of Art site.